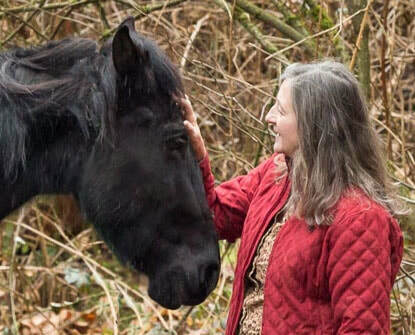 Currently in the US, anyone can call themselves a horse trainer or behaviorist without having to meet any requirements for licensing or experience. Some training techniques can be harmful to your horse or worsen the behavior problem. You have a right to know how any equine professional will work with your horse. Conduct an interview and ask questions about their approach, experience, education, and insurance. See our article What is an Equine Behaviorist? Motion Sickness, Trailer Loading Troubles, and Your Horse. Motion Sickness, Trailer Loading Troubles, and Your HorseCould motion sickness make a horse reluctant to load and cause him to scramble in the trailer? Find out what the research says. A. Some horses do suffer from motion sickness, but not much is known about it or how common it is. Transporting horses involves a number of challenges, including loading, confinement, restraint, environment (e.g., road noise), and movement (1). Researchers Santurtun and Phillips investigated the effect of vehicle motion on a few livestock species, including horses (2). Some animals experienced clinical signs consistent with motion sickness, including: salivation and licking/chewing, gastrointestinal (GI) symptoms and frequent defecation, eating or chewing on nonfood items (pica), elevated heart rate, stress behaviors, teeth grinding, pawing, and stepping back and forth to maintain balance. Emesis (vomiting) is also a GI sign of motion sickness, but horses can’t vomit. A video you shared shows that your gelding was relatively easy to load but his behavior problems began as soon as the trailer started to move. He scrambled, leaned against the trailer wall and divider, raised his head and pulled back against the lead rope, dropped his hindquarters with legs splayed, and shifted position frequently. After a few minutes he was lathered in sweat. These behaviors suggest that he is struggling to maintain balance, even though the trailer is moving slowly and has nonskid flooring. The balance challenges and possible motion sickness would understandably also make your horse nervous. Why do animals get motion sickness?Experts don’t know exactly why some animals get motion sickness. A leading theory is that it’s caused by conflicting sensory input from the visual system (eyes), vestibular system (ears), and proprioceptors (joints). One sensory system is telling the horse that its moving, but another system is telling the horse that its standing still; the contradictory signals to the brain cause motion sickness. This would be similar to becoming carsick. A second theory is that motion sickness is caused by vehicle movement and the resulting postural instability. This would be like standing up in a small boat on rough seas. Santurtun and Phillips found evidence supporting the second theory (2); livestock with motion sickness made persistent efforts to control and stabilize their balance during transport. A horse needs to make adjustments to stay standing upright in a moving vehicle, because the “ground” is unstable. They’ll typically brace themselves by splaying their legs and raising their heads and necks (1), which describes your horse’s stance exactly. Heart rate increases during trailering, so not only are these horses unbalanced, they also appear to be stressed out. How is motion sickness managed?To manage motion sickness, an important first step is to reduce vehicle movement. A skilled transport driver will avoid rough roads, refrain from sudden braking and acceleration, and take smooth, slow turns around corners (3). Leaning against something in the trailer—such as other animals and fixtures—can also help the horse stay balanced during transport. They also need enough room to step back and forth, adopt a splayed stance, and raise and lower their head. A few studies (2,4) have found that horses loaded facing backward (opposite the direction of travel) are less likely to lose their balance and have lower heart rates than horses facing forward, but other research has found that a horse’s orientation in the trailer has little or no effect on its ability to balance (5). A camera installed in the trailer will allow you to look for any signs of distress or problems your horse may have maintaining balance. Can medication help reduce motion sickness?Dogs, and especially puppies, often become sick when riding in a moving vehicle. Veterinary treatment for motion sickness in dogs is relatively advanced and prescription and nonprescription medications are available to reduce nausea, drooling, and vomiting. By contrast, few veterinary treatment options are available to relieve signs of motion sickness in horses. Management (described above) and nonprescription supplements calming supplements might be recommended by veterinarians and behaviorists to reduce anxiety related to transport. I contacted several equine veterinarians and thoroughly searched the literature, but to the best of my knowledge a veterinary protocol for horses that includes medication for treating motion sickness is not yet available. Take-Home MessageSome horses with suspected trailer loading problems are probably suffering from motion sickness, which can’t be fully resolved through management and behavior modification techniques alone. During transport these animals struggle with balance, suffer GI distress, and become anxious. Horses might also anticipate this unpleasant experience and become reluctant to trailer load. As someone who suffers from motion sickness and relies on a Scopolamine patch for relief, I have great empathy for these horses and look forward to the improved welfare and reduced transport-related problems that will come with advances in our understanding and treatment of equine motion sickness. Leadon, D., Waran, N., Herholz, C. & Klay, M. (2008). Veterinary management of horse transport. Veterinaria Italiana 44, 140-163. Santurtun, E., & Phillips, C.J.C. (2015) The impact of vehicle motion during transport on animal welfare. Research in Veterinary Science 100, 303–308. York, A., Matusiewicz, J. & Padalino, B. (2017) How to minimise the incidence of transport-related problem behaviours in horses: a review. Journal Equine Science 28, 67–75. Clark, D.K., Friend, T.H., & DeUmeier, G. (1993). The effect of orientation during trailer transport on heart rate, cortisol and balance in horses. Applied Animal Behaviour Science, 38, 179-189. Gibbs, A.E., & Friend, T.H. (1999) Horse preference for orientation during transport and the effect of orientation on balancing ability. Applied Animal Behaviour Science 63, 1-9. What questions do you have about horse behavior?